Botanical Name: 1. Ephedra sinica stapf; 2. Ephedra equisetina Bge. ; 3. Ephedra intermedia schrenk et C. A. Mey. 1. Spontaneous sweating. 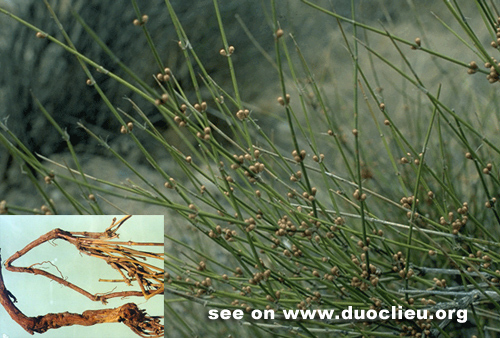 Ephedra root (Mahuanggen) is used with Astragalus root (Huangqi) and Chinese angelica root (Danggui). 2. Night sweating. Ephedra root (Mahuanggen) is used with Fresh rehmannia root (Shengdihuang) and Oyster shell (Muli). Cautions & Contraindications: This herb is contraindicated in cases with exterior syndromes.